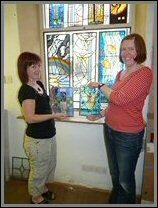 An informal and highly enjoyable practical introduction to the ancient craft of stained glass. 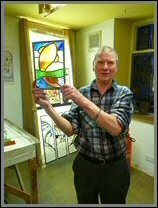 Learn and use the principal techniques including glass cutting, working to a cartoon, leading up and soldering and produce your very own panel of stained glass to take home. The price is £144.00 (inc VAT) per attendee and includes full tuition from our expert craftspeople and all materials. 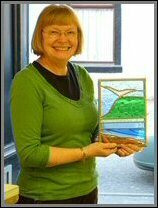 The course is held at our Clitheroe studio and runs from 10am until around 4.30pm. For the nearest long stay parking (2 mins walk from our studio) please click on this link. Where possible we respectfully request those arriving for the course do so promptly between the hours of 9.45 – 10.00am. 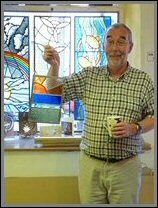 Please note; to enable each attendee the opportunity to achieve the goal of producing their own panel of stained glass (and also allow each a fair and equal share of the tutors time) our course is carefully structured. Unfortunately the limited time available does not allow for attendees to work to their own designs. A selection of designs on varying themes and levels of difficulty are provided. or drop into our Clitheroe studio. I just wanted to thank you for a great day on Saturday, I really enjoyed it. 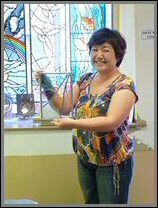 The atmosphere was so warm and friendly and the teaching first class. “Just to say thank you for your tuition and patience.